A council covering one of Britain’s wettest areas has said it needs a ‘miracle’ to solve its highways structural maintenance problem. In the past 10 months alone, Conwy County Borough Council’s bridges and retaining walls have encountered 56 safety-critical adverse incidents, estimated to cost £1.54m to repair. Officers asked the authority for £1.8m capital funding for bridges this year but were allocated £590,000. There is an 84% funding shortfall against the estimated cost of works needed in 2018/19. ‘We do need some kind of miracle to sort out this problem,’ said Don Milne, cabinet member for environment, roads and facilities, presenting a report to the council’s cabinet by his service head Geraint Edwards and flood risk manager Dyfed Rowlands. Conwy’s uplands include much of rain-lashed Snowdonia but a recent review found that some structures were missing from the asset register. Scour problems and collapsed retaining walls can result in long diversions and can cut off some communities from access by emergency services, the officers said. In the past five years, the assets’ overall condition has fallen from ‘fair’ to ‘poor’ and is in course to be ‘very poor’ by 2023/24. 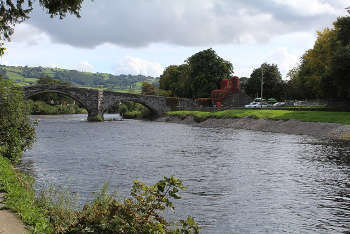 Structures subject to adverse incidents since October include several bridges affected by scour in the coastal town of Llanfairfechan, while the Grade 1-listed bridge in Llanrwst (pictured) requires a £50,000 spend on a scour apron.